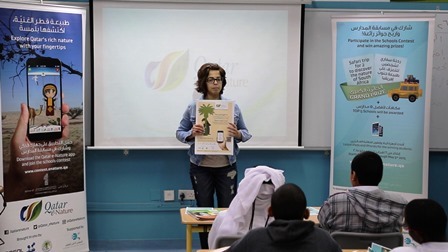 As part of the awareness plan on the Qatar e-Nature schools contest, representatives of Sasol Qatar have conducted field visits to schools in Qatar, throughout the contest period. The team began their visits by a live presentation about the contest. The students then downloaded the award-winning mobile application and started answering questions. Sasol representatives saw high participation rates from the students, as the team interacted with the schoolchildren. Winners of the competition will be revealed in May 2015. Prizes include a trip to South Africa to explore country’s beautiful nature and the latest version of the iPad and iPhone.